What a bargain! 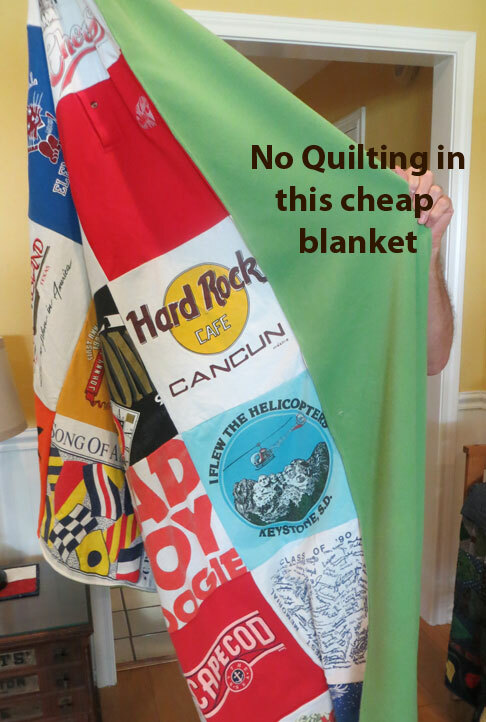 But, before you spend your $74.99 for 16 of your favorite t-shirts made into a blanket, read about difference between a quilt and blanket. Think about this. How important are these t-shirts to you? Are you willing to throw those tee shirts away, and get a crappy blanket to preserve your memories? "I had this done for my son and am very unhappy. NO Quilting - so can't wash, no borders, ugh"
She went on to lament how that company had chopped a good portion of the images off of the shirts to make a 12" square. She also mentioned that the "girly" green fleece on the back was not what she had ordered for her grown son. Attributes Of A Cheap Blanket? Fleece Backing - As mentioned above, fleece, which is a cheap polyester fabric is used on the backside of the blanket. This is regularly on sale at Joann Fabrics for a couple of dollars a yard. Interfacing/Stabilizer - This is an important part of making your t-shirts last a lifetime. The stabilizer is ironed on to the back of the t-shirt and becomes part of the quilt. Without a stabilizer, your quilt/blanket becomes a saggy mess when laundered. There are different types of stabilizer. Ask for a 100% cotton interfacing so that your t-shirts remain soft and cuddly. Craftsmanship - The difference between minimum wage employees and someone who has been quilting and creating quilts for years. Have you ever heard of "you get what you pay for?" Well, that is true with t-shirt quilts or most anything where quality counts. First of all, let's figure out whether you want a QUILT or a BLANKET. A blanket is only two layers. The top (your t-shirts) and the backing; usually fleece or a sheet. A quilt consists of three layers. A top, batting and the backing. More about the Difference between a Quilt and Blanket.